This is not the week that Democrats were expecting to have. Right on the heels of their epic blunder in trying to stop Justice Kavanaugh’s confirmation to the Supreme Court, they and their mainstream media mouthpieces clearly thought that Senator Elizabeth Warren’s campaign to reembrace the “one-drop rule” and thereby “prove” her Native American claims would be a brilliant turn of fortune for the party. By delivering a direct riposte to Trump’s periodical ribbing of Warren’s racial fraud just ahead of the November elections and showing that Warren was maybe 1/32nd (at best) or 1/512th (at worst) Native American, the evil Drumpf and his minions were sure to be vanquished. Those dreams have not come to pass, to put it charitably. 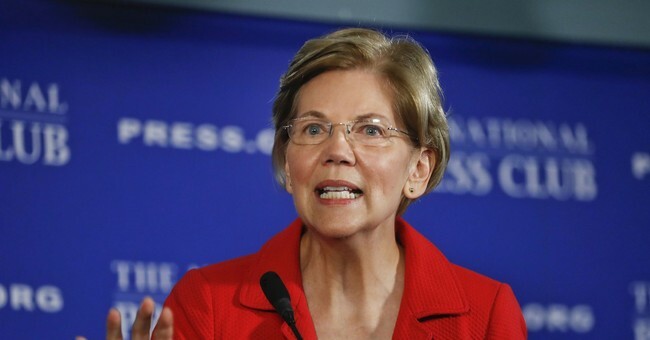 Following the lead of the Boston Globe’s mathematically-challenged reporters and their inability to divide repeatedly by two, the New York Times was one of many outlets that similarly charged into the fray on Monday by proclaiming that Warren had been vindicated by her newly obtained DNA test. Mr. Trump’s unrelenting mockery of Senator Elizabeth Warren as “Pocahontas” — questioning her claims about having Native American heritage — has prompted Ms. Warren to release the results of a DNA test that she says provide proof of her ancestry. And in a carefully choreographed video that featured interviews with her conservative relatives, her former law school colleagues and Dr. Bustamante, a professor at Stanford University — as well as clips of the president mocking her — Ms. Warren fires what amounts to a warning shot against Mr. Trump. The video she released features footage from earlier this year in which Mr. Trump vowed to contribute $1 million to her favorite charity if she took a DNA test and it showed she had Native American roots. It took until the fourteenth paragraph of the piece until the Times bothered to admit that there existed any substantive criticisms of Warren’s fake claims to be a Cherokee “Pow Wow Chow” chef or a minority/Native American faculty member of the University of Pennsylvania and Harvard Law School. Still, the NYT only included the Cherokee Nation’s condemnation of Warren in paragraph eighteen (without of course explaining why they were so peeved) and never directly mentioned Warren’s stint at Penn. But he did say that, at a July rally in which he talked about a potential future debate against Ms. Warren, where he would dare her to take the test. “And we will say, ‘I will give you a million dollars to your favorite charity, paid for by Trump, if you take the test and it shows you’re an Indian,’” he said. By mid-week however, with the walls of Warren’s fake tipi obviously crashing down around her head, the Times’s editorial board, possibly in an attempt to prove that they are not all complete partisan hacks, finally began to release some pieces that were at least somewhat critical of Warren’s handling of the matter. This included, unsurprisingly, a column by Ross Douthat, one of NYT’s relatively more right-leaning contributors. Senator Warren’s genetic-ancestry results suggest she has a Native American ancestor, most likely more than six generations back. But a few segments of a person’s genome that indicate she may have indigenous ancestry does not make her Native American. To be Native American is to be a member of a tribal community and recognized by that community as such. DNA cannot vouchsafe tribal identity or any other community affiliation. When we’re faced with difficult issues about the past that bear on the present, it is tempting to take these tests as proof of identity. But these genetic tests cannot confirm social dynamics. Identity is socially, politically and legally determined, even if shaped by genetics. Yet, genetic ancestry testing does not offer insights about these dynamics. So we can’t look to DNA to settle debates about identity. It’s somewhat difficult to parse out exactly how Nelson can simultaneously believe that “DNA can’t tell us about identity” while “identity is…shaped by genetics,” but this exercise in doublethink seems to stem from the inherent ridiculousness and implausibility of her outdated, blank-slate view of human nature more than anything else. On some level, she must know that her article’s argument from ignorance — namely that because we have “incomplete data about human genetic diversity,” genetics can’t tell us anything about who we are (the very essence of our identity) — is incredibly weak. She certainly can’t justify throwing out decades of groundbreaking research from scientists such as Luigi Cavalli-Sforza — who died just this summer after a lifetime spent pursuing the genetic basis of identity, population migrations, and human evolution — without serious evidence or arguments. However, if Nelson is really so convinced that her social science credentials can overpower actual hard science, instead of writing underwhelming opinion pieces for the New York Times, she should be preparing her grand case to sue 23andMe and other genetic testing services for fraud. She stands to make millions if she can prove her claims in court. Why not give it a try, professor?